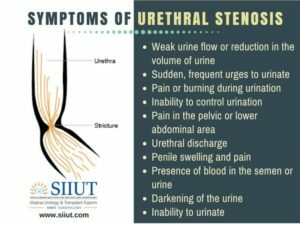 Urethral stenosis is a health condition which was characterized by the blockages in the urethra, the tube which drains urine from the bladder to outside of the body. There are a many causes for this condition, and assortment of treatments is available, depending on the main cause. Generally, this condition is identified and diagnosed by the urologist, and he or she usually takes charge of the treatment plan as well. In certain cases, urethral stenosis is congenital that means someone was born with it. Cases of congenital urethral stenosis generally become noticeable within a few years of birth, identified by when a child have difficulty to urinate or have trouble with potty training. This sometimes requires surgical treatment, to widen the ureter so by that it is easier to urinate. Urethral trauma, lichen sclerosus (also known as Balanite Xerotica Obliterans), urethral infections, dermatological disease, previous interventions repair of hypospadias urethra cancer. Symptoms like difficulty to urinate, Urinary infections, feeling of incomplete, repeated urination to empty the bladder, occurrence of blood in the urine, blood from the urethral meatus, sometimes with fever. To diagnose the urethral stenosis doctors initially likes to start with examination of a urine culture, to see whether the problem is caused by an infection or something else. Doctors may also ask to perform a urogram to get an image of the urinary tract and to look for any blockages like cysts and stones or to check for congenital urethral stenosis. In the incident the cause of the blockage is an infection, in this for resolving the issue antibiotics will be used often, along with anti-inflammatory drugs to create more comfortable to the patient. Stones and cysts may specify a need for surgery to correct the problem, in addition to the surgery tumors usually require the use of radiation and chemotherapy.